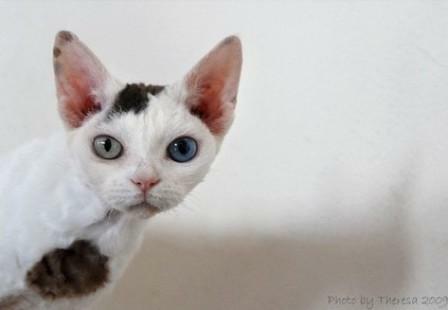 The Devon Rex cat is an unusual cat breed. With its curly coat, large eyes and gigantic ears it has been described as having a 'pixie-look'. 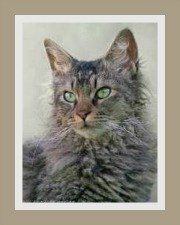 The curly coated cat from Devon in England was the product of a mating between a curly coated feral tom cat and a stray female cat. The curly coat is said to be caused by a simple recessive gene. The Devon Rex is a slender cat with a medium length body, strong muscles, fine bones and relatively broad chest. Its legs are also long and slim with a fine bone structure and you guessed it, the tails is also long and slender and furnished with short hair. The Devon's head is shaped like a small modified wedge, which essentially means that it is slightly longer than it is broad. The front view of the cat's head is delineated by a series of three distinct convex curves starting with the outer edge of the ear lobes, followed by the cheekbones and then the whisker pads. It has a well developed and strong chin, full cheeks, short muzzle and short nose. Whisker pads are prominent with curly harsh whiskers. This curly coated cat has large, oval-shaped eyes. 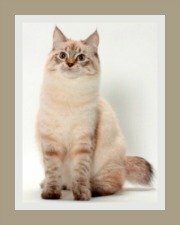 Any eye-color is acceptable, but generally, colorpoints will have blue eyes and aqua-color eyes are seen in mink color cats. The color should be luminous. It has very distinctive ears - very large, cone shaped, very wide at the base and set low on the head and the tips are rounded. Ears are covered with fine hair with sparse hair inside the ear. Ears can have lynx tips. 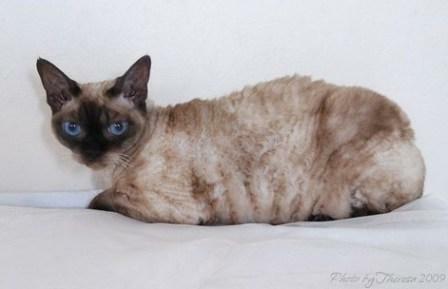 The Devon Rex's coat is soft, fine, kinked or wavy and can be with or without guard hairs. 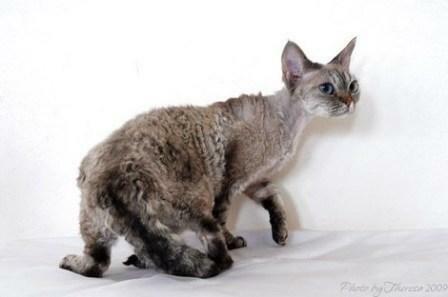 Its coat is not as neat as the Cornish Rex's coat and is described as looking more like a poodle or sheep's coat. The coat is medium-short on the legs, tail, sides and back and very short elsewhere i.e. neck, chest and abdomen. Sparse hair is seen on the temples. The coat will vary between individual cats, ranging from a shaggy mop of loose curls to a suede coat in others. The Devon must be well covered in fur - balding in adults and kittens is not accepted for show cats, but the coat may vary during the cat's development or seasonally. Its coat reaches maturity at around 6 months. 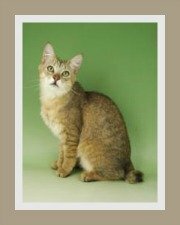 Devon Rex colors: all coat patterns and all colors are accepted. 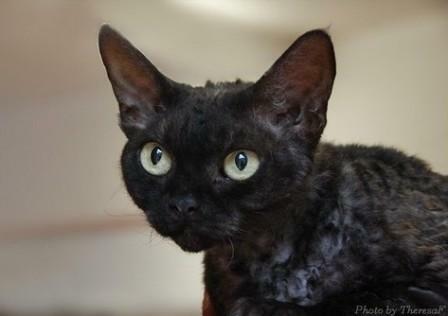 Devon Rex are suited to indoor and apartment living as they are sensitive to cold. Any indoor cat should be supplied with sufficient toys and cat trees to keep them entertained. These cats are perfect for any family. Yes, they adapt well to children provided they are handled gently. Yes, they adapt well to other pets. New pets need to be introduced gradually and owners need to respect the rights of existing pets. These domestic cats are described as 'monkeys in cat's clothing'. They like to be involved in everything and will perch on your shoulder to ensure that they do not miss out on anything. They are lively, active, playful, incredibly acrobatic and excellent jumpers. Owners call them 'Denise the Menace' and clowns as they are known to swing from curtains and to get stuck into any snack that may lie around. 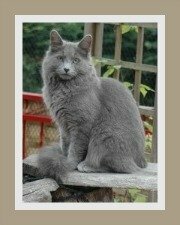 They are friendly, loving, affectionate and sensitive cats and added to this - alert and inquisitive. These cute cats are people-orientated and ideal companion cats with quiet voices. Devons are little heat-seeking missiles that love to sneak under bed covers or lounge on anything warm like the top of TV, heater vents or computers. Devon Rexes are low shedding, but they do need to be bathed regularly as they tend to sweat. Their ears produce a fair amount of ear wax which needs to be cleaned. 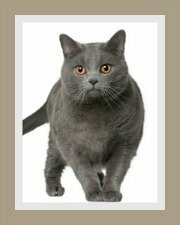 Our cat care pages provide excellent tips on grooming. 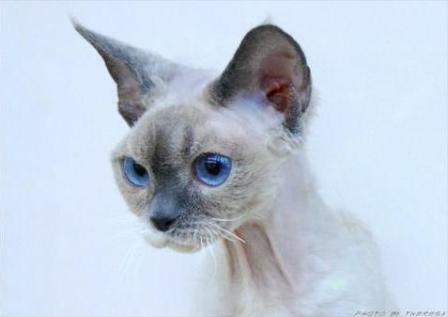 The Devon Rex cat is a low shedding breed, NOT a hypoallergenic cat breed. Some people with allergies to cat hair seem to tolerate this cat, but check before you adopt! 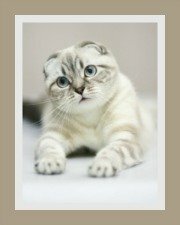 Allergy sufferers need to visit our chapter on hypoallergenic cats to find out more about this subject. Like all cats they need an annual check-up, vaccinations and regular de-worming. Do consider cat health insurance for your cat. Feed your Devon Rex cat the highest quality cat food you can afford. This can be homemade or commercial dry or canned food. Avoid cow's milk in you kitten's diet - cat's drink water! The Devon Rex has a long life expectancy of between 10 - 15 years.